Well, hey 'Fetti Fans! 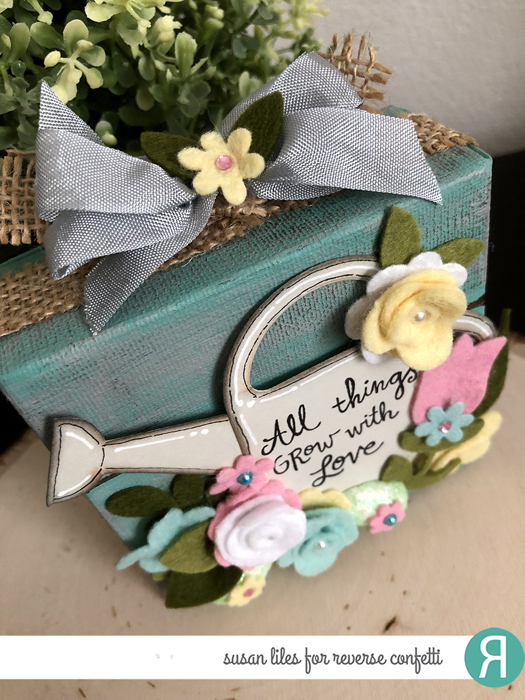 We have a very special Blog Hop happening today--REVERSE CONFETTI and MY SWEET PETUNIA, the makers of the original MISTI (Most Incredible Stamp Tool Invented) have teamed up to bring you some fresh inspiration with a Spring Fling Theme! There are prizes to win, so be sure and read to the end for all those details. The hop started over on my friend, AMY TSURUTA'S blog, and you should have made it here from JEANNE STREIFF'S blog. If that's not the case, I have a full link list below, so you can hop on or go back and see what you missed! You don't want to miss anything, you know! 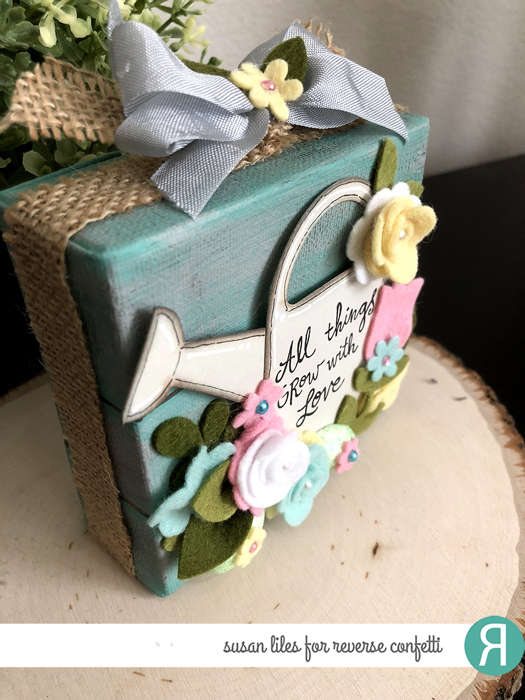 For my project, I created a little 4x4 chunky canvas to display in my tiered stand that I change out for different holidays and seasons. I painted it with some Country Chic Chalk paints to create a faux wood plank look in the color Bliss and a few others. 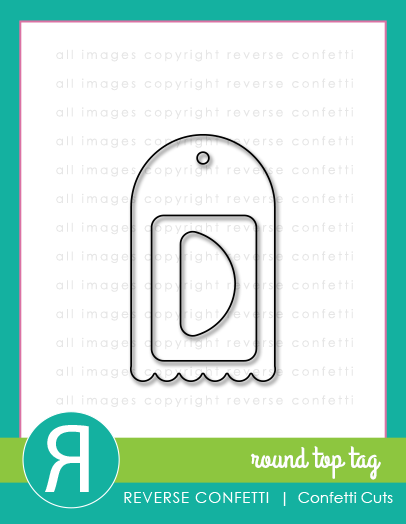 Once my canvas was painted, I made my watering can from REVERSE CONFETTI'S ROUND TOP TAG Confetti Cuts. The spout was drawn by hand, cut out and attached, and the side handle was just a repeat of the top of the tag. 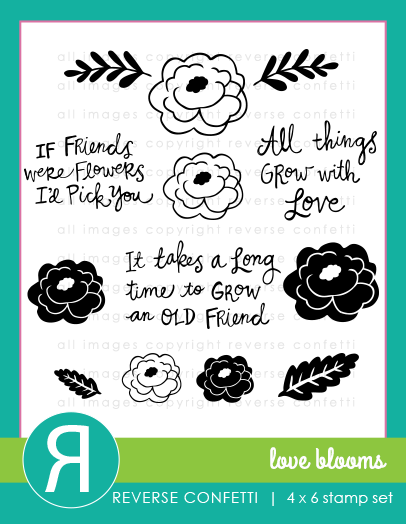 The MINI MISTI is the perfect tool to center my sentiment from the LOVE BLOOMS stamp set. I love the doodle lines and inked edges I did on the can for extra details! Next came the most fun part--making all the flowers! I used the BLOOMS 'N BUDS Confetti Cuts and several colors of felt for this. I also cut a small Dollar Tree foam Easter egg in half for more embellishments (did y'all know it's so easy to do that?!). I figured out ways to crease almost all the flowers and leaves to make them dimensional. The roses are the largest flower, cut into spirals, rolled and hot glued to a smaller flower of a different color. The added half peals and gems make them look so sweet! Then I just arranged them and hot glued everything down, including the burlap ribbon and top ribbons and embellishments. I absolutely LOVE how it turned out and already have a request to make one for a dear friend of mine. I hope you are enjoying this truly inspiring hop! I can't wait to see all the projects myself! Your next stop on the hop is the MY SWEET PETUNIA blog! Before you go, you should leave a comment to be added to the prize drawings! 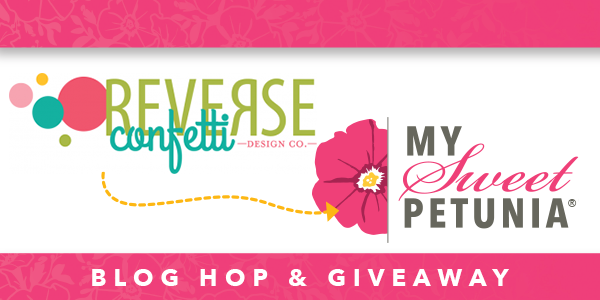 We will choose two lucky commenters from the hop to win one of two prizes: a $60 shopping spree at www.mysweetpetunia.com and a $60 shopping spree at www.Reverseconfetti.com- you must leave your comments no later than Sunday, March 25th, at 11:59 PM Central time and winners will be announced on Tuesday March 27th, on the Reverse Confetti and My Sweet Petunia blogs. Here is the full Link List for our fabulous hop today! Oh, how sweet. 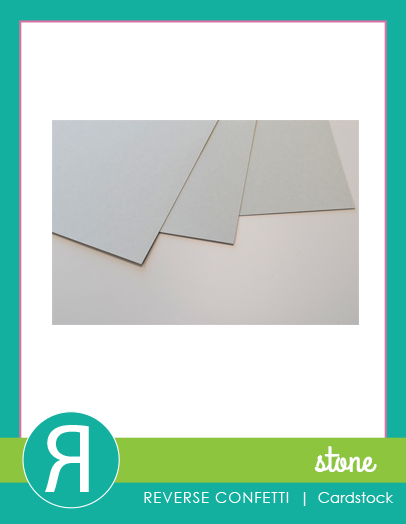 I love seeing the possibilities beyond cards for my card-making supplies. Your canvas is beautiful. And a great idea for a spring gift. This is so amazing!! I love your felt flowers. Just the cutest. And what an awesome idea - making the water can from the tag!! Really inspiring, Susan! Beautiful creation! Love how you used the tag in an unusual way - very clever! Amazing création ! bonne idée avec le tag en arrosoir ! Love those felt flowers. I never would have thought to use that set for that! Gorgeous! 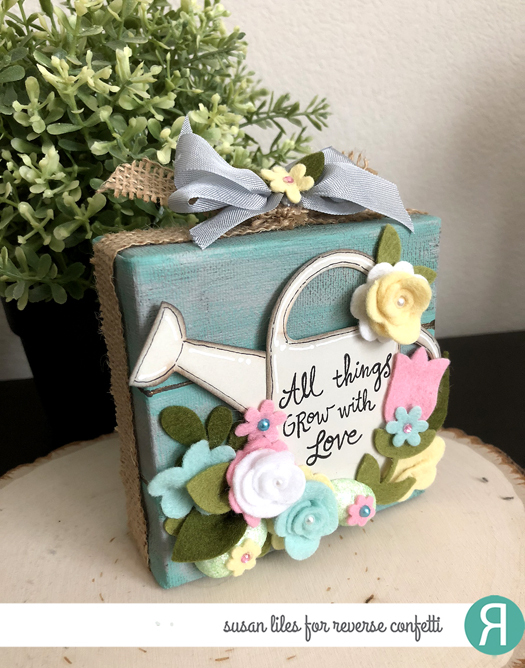 I love all the felt florals and pretty little watering can! Wishing for a tutorial on making those Cute flowers!! I enjoying seeing how smartly girls (You) come up with new designs (watering can) from things I’d never think of. Wow! I would never have thought of working on canvas. Great idea! Definitely Spring. So bright and cheery. Thanks for sharing! Question—did the felt cut easily with the dies? What machine did you use to die cut the felt and how many runs through? Thanks. How talented you are. So pretty a perfect spring project. The sentiment is one that can be used again and again. Thanks for sharing. Wow! What a clever project! 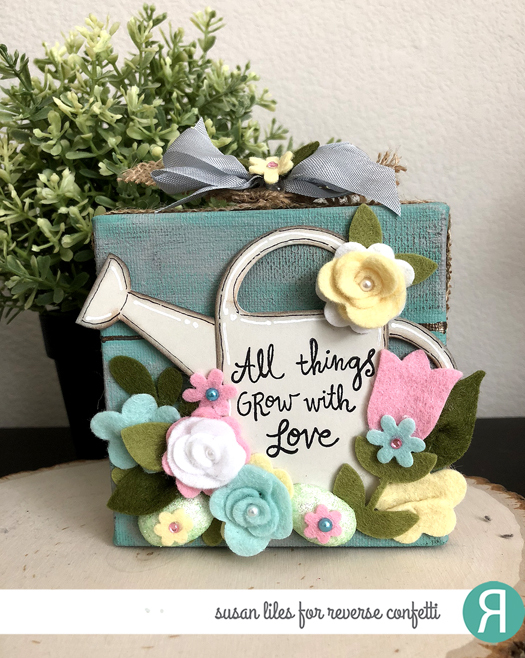 Love the watering can and felt flowers. So, so cute!!!! Love the felt for the die cuts! Your 3D project isn’t perfect for spring. Makes me smile. Such a sweet creation! Those felt flowers are precious! This is so pretty - I love the felt flowers! what a gorgeous décor piece!! love how you used the dies to create your watering can! Beautiful project for home décor, Susan! Thanks for sharing. So pretty. Love all the details, colors, patterns, and design. So creative. Just lovely. This is so creative! I love how you created the watering can and the flowers are so pretty! This is so adorable! So creative! I am sure that you are going to get lot's of requests to make it!!! This is fabulous! You've inspired me once again. Just adore that shade of blue and the sweet felt flowers! This project is absolutely fabulous! Love everything about it. I am in totally admiration!! Such a creative Home Decor piece!!! So sweet!!! Love this clever, unique project! You are truly creative! Thanks for sharing this awesome inspiration! This is the cutest project ever! I love using the dies to cut flowers! So creative! A person just can’t go wrong with a Misti or any of these beautiful stamps or dies! I was so surprised that you said this is 4 x 4!! It looks so much larger. Small makes it ever so much cuter! Wonderful use of all the dies. Love what you created! The felt flowers are so pretty. What a clever project! I think it's brilliant that you constructed a watering can from a tag die. Just amazing. Please add me to the list of friends who would like a similar gift!! Love your watering can!! How creative! The felt flowers really do add so much to your project! Wow! I'm amazed at your creativity. Love the felt flowers, the burlap, and all the little details. Such a creative project! Thank you! So beautiful! The felt flowers gorgeous and cutting the dollar store Easter egg in half - genius and such a fun touch! The sentiment goes perfect! Love, love your fabulous canvas. Thanks for sharing your inspiration. Wow... that is amazing!! So clever and creative!! A very pretty spring-like box! Beautiful project! Love all the felt flowers! Beautiful project and I love the colors you used. Perfect for spring. Your project is way beyond my ability but a nice spring decoration to have in a home. Omgoodness, how cute! I love me some seasonal decor, and this is just too adorable and so perfect for spring! Those felt flowers are amazing! And what a creative way to make the watering can! WOW! Absolutely adorable and delightful! 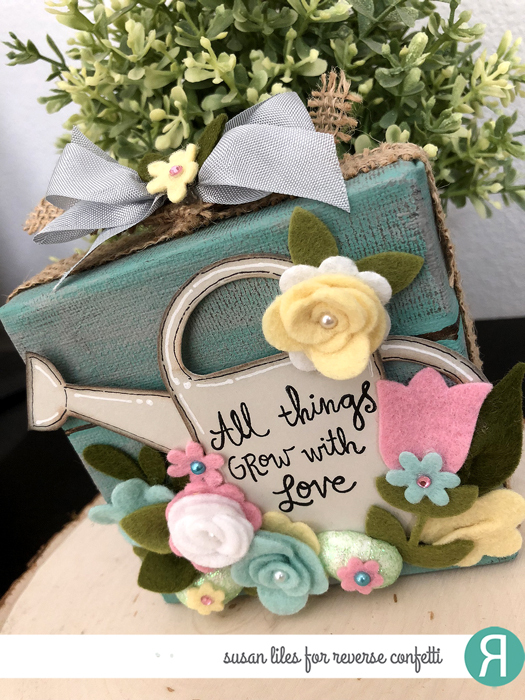 Love this spring project with the felt flowers! Oh, my! Love your gorgeous spring project! Such wonderful felt flowers! Truly, spring decor to be treasured for years to come! What an ingenious idea to use the tag die to make a watering can! I wouldn't have guessed it. Thanks for sharing such a beautiful decoration with us. Wow! Lovely watering can and flowers!!! Love how you created the can using the tag die!!! Lovely project, love the flowers! Wow, this piece of art is just lovely! I never think about using felt, even though I know others use it. However you show how great it is in our craft projects. What a gorgeous home decor piece! love love love this! 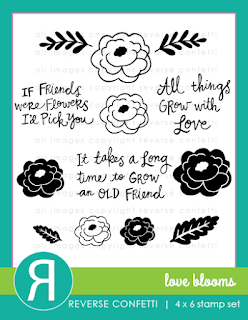 I'm always looking for diecuts that are great alone as well as with their stamp set... love these felt flowers you've created! And so cool how you put the watering can together! So sweet and I loved the way you did your felt flowers-- great project loved that it is different then a card! Gorgeous project and cute stamp and die sets. Oh my !! How cute is this creation !? !